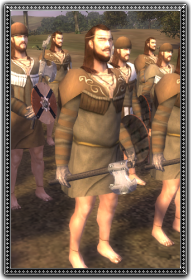 Kerns are Irish light Infantry made up of freemen armed with small hand weapons. Relying on agility rather than armour these light axemen can provide an unexpected challenge to their more heavily armoured opponents. Many Kerns seek an escape from poverty by fighting as mercenaries.